Dollhouses embody the idea of the perfect house in a specific culture, but ever wonder how doll houses came to be? They existed in Victorian times, elaborately built to mimic the outside of one’s own home, but what about before that? How did these beautiful items come to embody what we consider to be perfect? Why did these items become designated as a child’s toy? 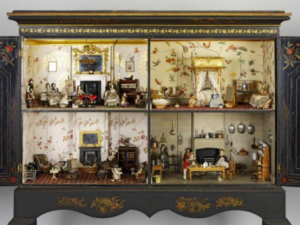 Originating in the early 17th century Northern Europe, doll houses, or cabinet houses as they were called at time, were not intended for use, but rather to display both pedagogy and wealth. The original doll houses were displayed within a glass front cabinet that could be likened to a china cabinet. The fronts could be opened and closed, but remained locked for the majority of their existence. The inside of the cabinet, divided into rooms, provided a colorful and exquisite manner to display miniature items of great wealth. Killer Cabinet. Dolls House. (W.15-389-1936). © Victoria and Albert Museum, London. Following the cabinet houses, the dollhouse transitioned into a more useful teaching method called Nuremberg kitchens in the late 17th century. These houses, which were all metal, existed without ornamentation, but designed to fill the utilitarian purpose needed. These houses existed with the sole purpose of teaching a young girl how to run a household, often taught by their mother. Girls learned the important objects of the house by recreating situations within the dollhouse, practiced giving orders to the cooks and servant dolls, and learned the importance of being the lady of the household. Doll House from the Victoria and Albert Museum in London, this doll house is an example of what mothers used to teach daughters how to run a household. In the 18th century, we see the emergence of the baby house, or what we commonly think of as the Victorian doll house. These houses were exact replicas of the house of the owner. These houses were intended to show wealth, in a miniature form of the wealth of the owner. Each room was designed as set up in the exact form of the real house. Much like the cabinet houses, the baby houses were not intended for play, so when did this distinction come about? The Tate Baby House at the Victoria and Albert Museum in London. In the 19th century the concept of childhood changed to what we consider childhood to be now, play. It is at this point that we see the dollhouse become an object of play and fantasy, but the houses still remained unaffordable as custom items. It was not until the emergence of the Industrial revolution that dollhouses were able to be mass produced and became more affordable for the public. But what about the transition to bright colored plastics houses? That transition happened more recently in history, in the 1940s to be exact. With the introduction of these new materials, doll houses became even cheaper to manufacture as well as more durable. The house itself would be made of steel while the interior contained plastic furnishings. After WWII, toy companies resumed production, many with their own specific doll house lines. Items within the house became more interactive. Doors could open and close, drawers opened, and washing machines could spin; the dollhouse became the ultimate interactive experience. The time period between the 1960s and 1990s represent the so-called dollhouse boom. Increased transportation and Distribution allowed for houses to be made in other countries, like China. Houses were created to represent different kinds of houses, but there was also a reemergence of historical houses. Plastic PlayMobile houses recreated 1900s French estates, but there was also a demand for modern day doll houses. These new dollhouses became a teaching tool yet again for young girls to learn what it means to be a housewife, to interact with other members within a household, and to foster an imagination of what a home should look like. Within recent years, doll houses have moved beyond the “typical house”. Manufactured as suburban homes, apartments, and treehouses, the possibilities for new doll houses are endless. Our exhibit has decided to include an interactive dollhouse, forcing the visitor to explore and consider what home means to them. Will you set it up like the average house, or will you mix it up, move things around to represent what suits you?